What is Generic in .NET (Hindi)? In today’s program i have discussed Generic in .NET with Arjun Singh. Enjoy the discussion and please provide your feedback after viewing it. Indiandotnet providing a simple utility which help you in analyzing the Indexes for which need maintenance and for which we need to run some maintenance script. when you run the utility you will get following screen. Now you need to fill SQL Server name username & password and click on login button. 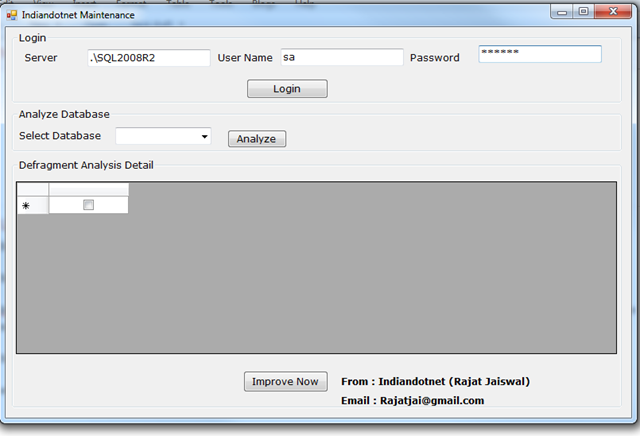 If the login is wrong then you will get error message else the database(s) name(s) which exists on that particular server is populated in just below drop which is select Database once you select the database for which you need to analyze the index defragment then click on analyze button. After the button click you will find the result in below grid. In the grid you will get index with name & table name with fragmentation details. Indexes which have fragmentation percentage more then 35% shows in Red color. Indexes which have fragmentation higher then 5% and lower than 35% shows in Yellow color. If the Row in Red color means you need to Rebuild the index and if it is in Yellow color then you need to Reorganize. Once you select the rows and click on Improve button then it will generate a script and you can run this directly on the server. As the Index build & reorganize depends on database size so you need to take care when you can run it. You can download the application code from download. Please feel free to give your feedback & comments.